Is this mish-mash mobile masterful at all? Review It's always nice to have a little look-see at the newest hardware, but the E600 isn't actually new as such - it's the reincarnation of several previous models, including T-Mobile's Dash and MDA Mail - as the Dash is called over here - and manufacturer HTC's own S620. Orange's incarnation, like the others, weighs in at 160g and measures 11 x 3.3 x 1.3cm so it fitted snugly into our busy editorial palms. 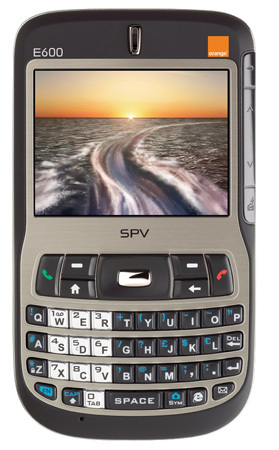 The E600 has an undisputable Palm Treo-esque design and blends together style with business-grade connectivity - it's a quad-band GSM/GPRS/EDGE device. Though don't except the E600 to be seen struttung up and down any Milan catwalks, because when it comes to design, Orange has got things very wrong. The E600's looks smacks of a central London designer sofa store. All you need is a good looking and affordable mix of springs and material, but what you end up paying over the odds for is actually very different. The phone's appearance is, in essence, ugly. A myriad of tiny keys, a single large central control, multiple colour buttons, a rubber backing, a brushed sliver front, a shiny encircling frame... all help to ensure the E600 will never be invited back to any fashion shows once its five minutes of fame are over. The pictures make it look far nicer than it is. However, if you are willing to look past the E600's aesthetic failings, then its operational ability and application performance do impress. Running Microsoft Windows Mobile 5.0, all but the most computer illiterate user - or Mac and/or Palm OS aficionado - will be able to find their way around the E600's various applications effortlessly thanks to the familiar Start menu.